The engine is an HO scale New England Rail Service New Haven class K-1b 2-6-0. The old coupler is a plastic KD clone with a mounting hole drilled in the shank. A .020 diameter pin goes through the shank & the holes in the cast-on scale coupler box. The new coupler is an all-metal KD #58 coupler with the trip pin cut off and the shank cut down. The Problem: the old coupler is starting to fail - i.e. the coupler face spring has lost its, um, "springiness" so (too) often the couple uncouples unexpectedly. The Second Problem: drilling a hole into that narrow, metal shank. I started a guide hole using the point of a safety pin, so the drill bit wouldn't travel. Yes, I'm drilling a hole. Or trying to. I'll eventually need a .025" hole to clear the mounting pin. That's a #72 drill bit. No way can I start that "large" (too big for the guide hole), so I started with a #80 bit. Yup - a .0135" diameter drill bit. I used a pin vise at first, but didn't get very far before - yup, you guessed it - the bit broke. I had another #80 bit, so I mounted that in my Dremel flex shaft and, using my variable speed foot pedal, I continued drilling. I actually got the hole .005" deep before that bit broke. I'm actually pretty proud I got that far, considering I'm drilling metal with a microscopic drill bit. In a Dremel. But I still have .045" to go. And I don't have another #80 bit on-hand. Yes, "Model Railroading is Fun" - or at least a lot more fun than bathroom remodeling or raking leaves. I'll take a couple broken drill bits over that any day. From you starting point with the #80 hole, you should be able to go to a #76 drill and get it started. Don't forget to add some oil while drilling metal! 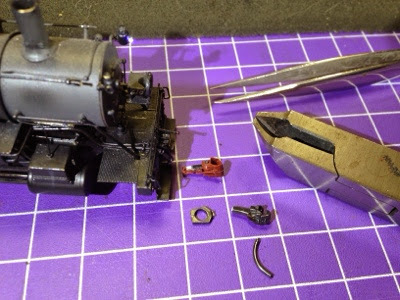 Anything should do, from Labelle that you use oiling loco models to 3-in-1. Also, back out frequently and clear the chips. I hope you are using a drill press and not trying to do it by hand. Ditto to what Pete said, but you don't absolutely need a drill press, just a good pin vise and a steady hand. Personally I prefer drilling the smallest holes by hand since I can better control the speed and pressure. The advantage to the press is, if your work is secure, that you avoid binding and bending which leads to breaking, as you have discovered. Those Kadee shanks are HARD metal compared to soft white metal castings. I just used a #76 to put a hole in a soft metal K brake casting - on the tip of the dust collector line. Patience, patience and patience are required, and many drill bits until the skill is honed. Keep at it! Should have clarified that the drill press comment we meant using the Dremel tool. Too easy on such a small object to wiggle the Dremel just enough to miss the start or break the bit when working with something like #80.